Charged over the discovery, I darted in to the store looking for her. In a heady rush I must would've missed some basics, because the counter clerk came to me. As per the custom, I had to submit my earlier made shopping at the counter in return of a token. I gave him the shopping bag, and he handed me a token. It was marked 8. I glanced around. My sister, holding my child's hand, joined in. We took opposite ends of the floor and dived in the racks. We went to the first floor, consciously not taking the elevator. Climbing through the stairs meant to be able to keep in check the ground floor as well. Strange as it may seem, so is life... Fast paced progress often blinds one to the roots. Ain't it so? Peeked into the book shelves, in to the secluded prayer area... No luck. Had she vanished or what! Dejected, we finally realized the dead end we were facing. The frenzied search had come to an abrupt, and blue end. This time we took the elevator. The descend was quiet and heavy, to the the extent that it made the elderly store employee accompanying us in the lift, look burdened. "Does Roohi Bano come here often?" I asked. "Roohi Bano, from TV". I said, though the hope had died. "No, I don't know. I don't watch TV, you see", answered the red-bearded baba patting my child's cheeks as the lift touched ground. "We haven't checked the basement!" I called out to Mani, my sister. Basement was a quiet place; almost a floor out of the Sleeping Palace. There didn't seem to be many people on the floor either: A visibly bored, salesman behind the counter, and another in the corner of the store. And with him in that corner was that lusterless bleached head that had, probably, once been a canopy to a rainbow no one could paint the colors of. Probably. I mean if it was her... If! My steps grew heavy. I reluctantly followed my advancing sister, suddenly very unsure of the point of this whole exercise. The woman was holding a soft, dressed in red cabbage patch doll; asking something softly from the sales boy at her side who didn't seem quite keen to be engaging with her. Reaching close, and rounding off from her backside to her front, I looked at her face. Something in me snapped. Loudly. And painfully. Mani stepped to the other rack. I followed involuntarily. The possibility of an upfront encounter, now becoming a reality, was no longer exciting. I grew weary. "Why!" She asked..."Don't you want to talk to her now?" To be fair, I no longer did. There was a woman who had once ruled over media, and people's heart for decades! Her charisma, her style was that of a born diva... Who was, and remains to date, the ultimate reference of class in her field of arts. However, what I had in front of me was a famished ghost of her! I didn't know this ghost. No one did. The store boy had no idea why he would be entertaining begging ghosts. The costly toy she had in her dirty, paint stained hands, seemed to be growing indignant over such disrespect... A mother who has no family left to her... why must she be here? This was no place for grubby ghosts. "Now, this is funny!" My sister was visibly irritated. "At least ask for an autograph, we've been running after her like loons!" "No," I heard myself mumbling, "... I'll ask for a hug. She may be missing some." I saw Mani smile. We know each other. 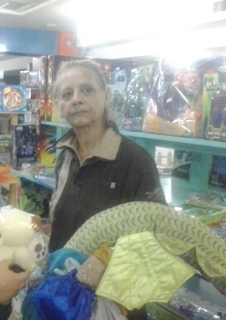 Roohi Bano, that's who she was, had put down the doll and was now holding a stuffed white dog from another rack. The sales boy at her side was signalling to his colleague at the counter to call him back. I cleared my throat, and moved towards her. "Excuse me, ma'am!" ... She looked at me and there was an awkward smile... "Are you Roohi Bano?" To my surprise, she didn't react with a shocked "Oh, you recognized me!". Trying at a faint, yet very self conscious smile she nodded, all the while trying to make up her hair with her free hand. I moved ahead... "Ma'am ... Can I give you a hug please?" And I took her off guard! Her old eyes stared at me in disbelief, but she quickly resumed charge of herself. Her wrinkled face laughed a hollow laugh. She was distinctly polite for her utterly uncouth demeanor, and the feigned superior manner in which she gestured her hand filled me with even great remorse. Why is she taking so much pain? Why act to be grand? I mean how burdensome it is to drag along the corpse of a status that has died since long. And no one even cares about it anymore! I moved close to her and in the moments that I was raising my arms to wrap around her, I wondered if I had lost every thought even remotely sane! In those last micro seconds before I touched her, when my embrace could have turned cold, I thought of running away almost a thousand times! With my arms around her, I squeezed her a little. That old, unkempt, frail woman, who probably had no one to herself... There was this sudden pressing desire to make her feel loved. Owned. Even if for a few fleeting moments! My hug grew longer. She stood still. Her arms by her sides. She didn't try to respond the warmth. And for once I felt like the ice was breaking somewhere. She was not acting to be on the higher platform now. She just received. A few seconds later I released my grip, and looked at her face. The pale of her face retained its paleness, exactly the tint of of her bleached hair. Maybe this could impart her a rosy memory in her forlorn seclusion. I thought. There was an awkward silence, and suddenly I realized I've been acting too bizarre for her old nerves! We needed some cliche's! I offered her a few sentences on the lines of "Ma'am, we've grown up watching you. All these years we've associated the word drama with you", I gestured towards Mani and myself. She beamed. "So, you still watch my plays?" I affirmed enthusiastically, and to my horror, I realized I couldn't recall even a SINGLE play of hers. Before she could ask me the inevitable question of which play I liked the most, I looked for an escape! "So you are doing it white?" She smiled a little and nodded. I have to cling more, to make her feel owned. I thought. "Can I have a picture of you?" "Are you buying toys?" silly question! I realized my mistake. All know that Roohi Bano had only one son, who moved to the other world in the prime of his youth when she was under treatment in the Fountain House. I had no business poking into a make believe world if she had any. "I meant, what age group? Maybe I could suggest you some toys. Are you looking for toys for young kids?" Her eyes welled up and she looked away. "They've grown up... " Pause "But I will give them." "They will keep these. Or they will not." "These are beautiful toys. They could keep a good cuddly company"
I had touched a raw nerve. This wasn't what I had wanted. Stepping back a little I asked her if there is anything I could do for her. This was a genuinely well meant query, but seeing her formal decorum, I knew for sure that she would turn me down. "Please talk to SuiGas walas. They don't listen to me." I blinked. She had proved me wrong. There was a dent in that seemingly concrete indifference! "They just tease. They say you first clear your electricity bills"
And in that moment of complaining, that lost soul of an old, seasoned actress, transformed into a frightened child of tender years. The look on her face was that of a child who has just found his mother and hasn't been over the trauma of having been lost. Such a child doesn't seek facts. "This is very unreasonable! Don't you worry, I'll talk to them." "Give me your number. I will call you when they will pester me next time"
I was perplexed for a few moments. Then I opened my bag, and found a pen; but I didnt have a piece of paper. I turned to Mani if she had any. She produced her hand-carry baggage tag from her flight earlier during the day. With a purple pointer I wrote my cell number on a PIA baggage tag. I wrote that too next to the phone number. She wore the tag in her wrist already full of multitudes of colorless bangles. "I will call you. Will you talk to me?" "Sure. Just drop me a word when they come and bother you. I'll get it fixed for you", I assured her. Falsely. "I'm a little short of money, could you buy me this?" And she picked that red dressed cabbage patch doll we had earlier seen in her hand. The sales boy, now realizing that finally there is a scope of some business in this ridiculously awkward meet up, showed up on our side. I handed him the doll. Mani ahead of us, keeping my son with her. "Buy me this dog too ... Look, it doesn't have legs," she said. And she looked pained. I picked the toy up. "Its very cute". "No. It's disabled. I like disabled people. Special people." Do you see it? The irony. She made various stops on our way to the counter, picking up toys: stuffed as well as mechanical. Always asking me if the toys were expensive. When we reached the counter, we had a number of items on us. There was an old looking child accompanying an emotionally charged me. While the bill progressed, she took a full look at me for the first time. "Umm... I work in marketing"
"Oh ... what do you market?" "There are many things. People, items, companies. All need marketing." "I'm writing a new play", she informed me. "I'm sure it would be awesome. Can't wait to see it"
"But, you seem to know interesting things ... Whats the most IN business these days? The one that gets you lots of money." "Which one do you want to do?" "The most IN one. Would you do marketing for me?" "I'll meet you again. Give me your address." I asked her to give me a call and I'd come to visit her. "You would? Promise? You will come to meet me?" And the lost child beamed. We began climbing the stairs. "You know what? Now I will need a pretty phone... 'cause I will have to call you", she said. "And you know what, people as beautiful as you, don't need pretty phones. Whatever they hold, they do, becomes beautiful." I replied. I saw her going quiet. She remained quiet for the rest of the climb. When we reached the ground floor, she turned to me and with her first full smile of the evening asked me, "Acha?" At the main cash counter while I made the payment, she kept playing with my son. She poked at his belly. Tickled him. And laughed. "He is so cute!" and added hurriedly, "MashaAllah". And then giggled like a carefree teenager ... "motoo!" The counter guy looked at us aghast. She took all her bags, far too many to hold in two hands. "It was very nice meeting you", I initiated the ending. "Will you talk to me, when I will call you?" She flashed me the most brilliant smile and made to the exit door. Mani and my boy had already exited. "Baji, your items! You had submitted this bag with us. You have the token." I had that token still in my hand. Number 8 token. A twisted closed circle. Eight. "What has happened to her?" Mani was waiting outside. She saw me coming and extended me a tissue. A 1975 portrait of Roohi Bano. ‘A real genius,’ this is how famous author and playwright, Ashfaq Ahmed, once described Pakistan’s TV and film actress, Roohi Bano. Bano was the most sort-after TV actress in the 1970s. Along with Uzma Gillani, late Khalida Riasat, Madeeha Gauhar, (and, to a certain extent, Sameena Pirzada), defined and almost perfected the art of serious TV acting for a host of Pakistani TV actresses that followed. 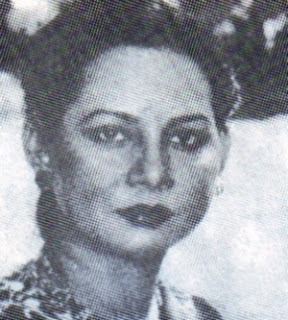 But Bano remained to be the finest in this league because even though she acted (as a heroine in a few films), and also took some light roles, producers and writers struggling to bring to the mini-screen plays by intellectual heavyweights, always chose her as their leading lady. The reason was simple: She could seamlessly immerse herself in roles that were constructed to express awkward psychological and emotional complexities. That’s why her most compelling moments can be found in TV plays scripted by Ashfaq Ahmad in the 1970s – a time when the author himself was struggling to come to terms with his own intellectual and existential crises, trying to figure out a path between the free-wheeling liberal zeitgeist of the period, populist socialism and Sufism. A video grab of a 1974 Roohi Bano play on PTV. Very few of Bano’s fans knew that the psychologically scarred roles that she was playing so convincingly were also reflecting what was going on in her own life. By the early 1980s, Bano, who had been such a popular and respected mainstay on TV in the 1970s, was only rarely seen on the mini-screen. It transpired that she’d been having serious psychological issues throughout the 1970s and had to be committed to a psychiatric hospital for treatment. She was still only in her 20s when she began suffering serious psychiatric problems that hastened her disappearance from the screen. And when (in 1988), she did return to the screen (after the demise of the Zia regime), her fans could hardly recognise her. She seemed to have aged rapidly and looked exhausted. Her great comeback never materialised. After just a few plays she went back on heavy medication and suffered another series of breakdowns. Today, she leads a reclusive life in Lahore, while her fans still long for that great comeback that she was expected to make many years ago. A great read. Very well written. Prayers and blessings for the four of you. As I scrolled down... I felt as if everything around me started losing all color and life... Feeling numb and empty. No, she didn't ... And I've an almost dead hope of she having not lost the number. Sadly, she didn't have any of hers when I had asked her for one. And thank you for doing what you did. I can tell the pain and despair she was in. And I can tell how your gesture made a little difference.